wow this does look great. hoping to have a TM ESB and GH master ROTJ lid one day. yeah i know along shot . but one can dream..
congrats on a job well done man. Take photos of it outdoors, on an overcast day......the results will blow your mind. I shoot all my props like this ever since a good friend gave me that tip. Seems to show off the details and true colors better. Very nice helmet!!!!!! Cloudy Day = one giant soft box of soft light. If you set your helmet up next to a sliding glass door or on a table next to a large window, your light becomes directional. For a window on a wall facing the opposite of the sun (a northern facing window), the light will be soft even on a blue bird day. For a window on a wall facing the sun (a southern facing window), the light will be hard on a blue bird day, but softer on a cloudy day. You can use a window sheer to soften the light from direct sunlight. Your backdrop is also going to affect the image. A simple clean background, whether it be white, gray, or black, will look much better than a busy background with wood railings, tree branches with or without leaves, chairs, or other busy lines and patterns. 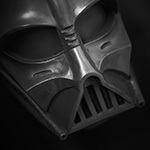 IMO, the Vader helmet begs for black and/or gray back drops - much like the Imperial environments. If you choose to photograph on a sunny day, wait until the sun 1 hour to 30 minutes before sunset, or once the sun has dipped below the treeline. You'll get beautifully warm directional light, or in the case of the sun being a bit below the horizon, you'll get that beautiful softbox soft light - but it will fade very quickly, so you have to be ready. ...probably should put this post somewhere else.